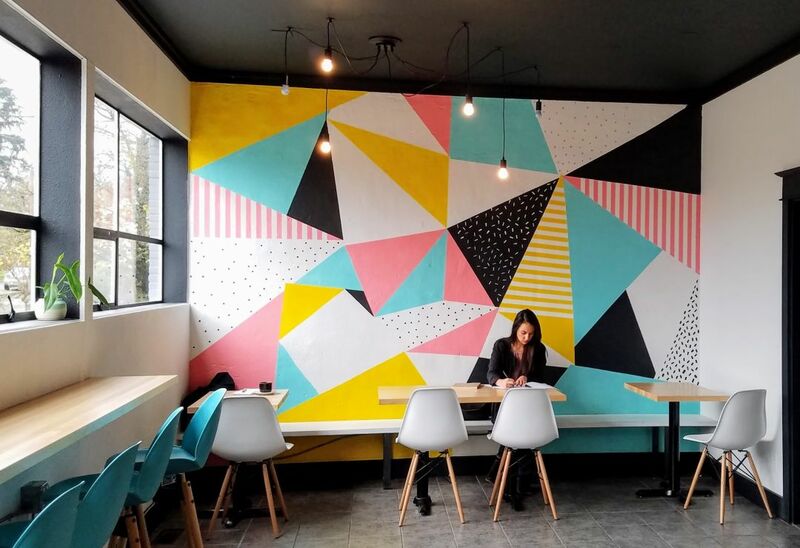 Kainos Coffee's eye-catching mural, painted by co-owner Marten Boyden's wife Mary—the local photographer/designer behind Mama Bear magazine. 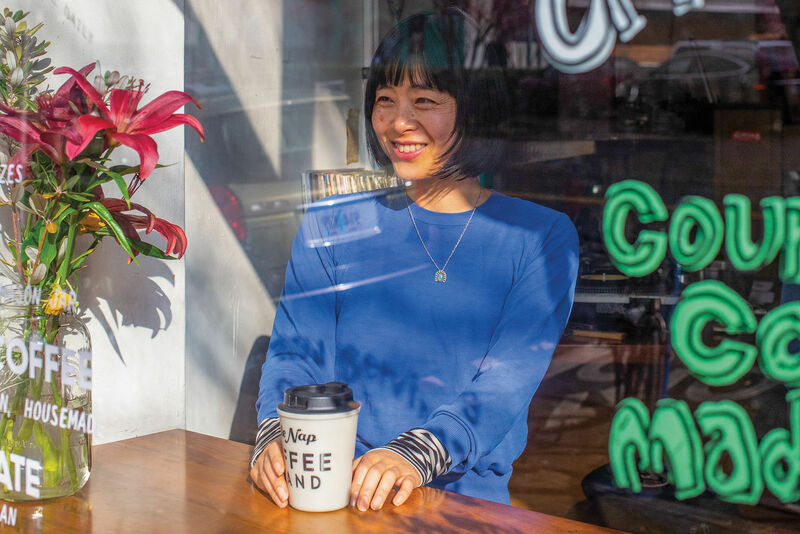 For coffee lovers, outer Northeast Portland—especially the Roseway and Cully neighborhoods east of Hollywood—is a bit of a quality caffeine wasteland, pitted against Safeway Starbucks counters and roadside coffee kiosks. But a handful of forward-thinking cafés, from community-minded Kainos Coffee to chic Vivienne and Native-owned Bison Coffee House, are emerging as anchors for the up-and-coming ‘hoods by virtue of great coffee and thoughtful mandates. Before Kainos Coffee was a café, it was a tidy teal and black cart parked in front of a dry cleaners on NE Sandy Boulevard and 66th Avenue. Through late summer and fall, Roseway neighbors flocked to the mobile roaster manned by best friends Marten Boyden and Austin Roberts, a pair of chatty millennial dudes with big opinions about coffee. “This tastes like ‘fruity-berry-yum,” explains Boyden, handing over a cup of house blend. “...It’s named Freakin’ Yum.” His roasting partner Roberts nods emphatically. Damned if Boyden didn’t nail it. The pair’s signature blend is bittersweet and subtly fruity with a rich chocolaty finish—great sipped straight and killer in a cappuccino. 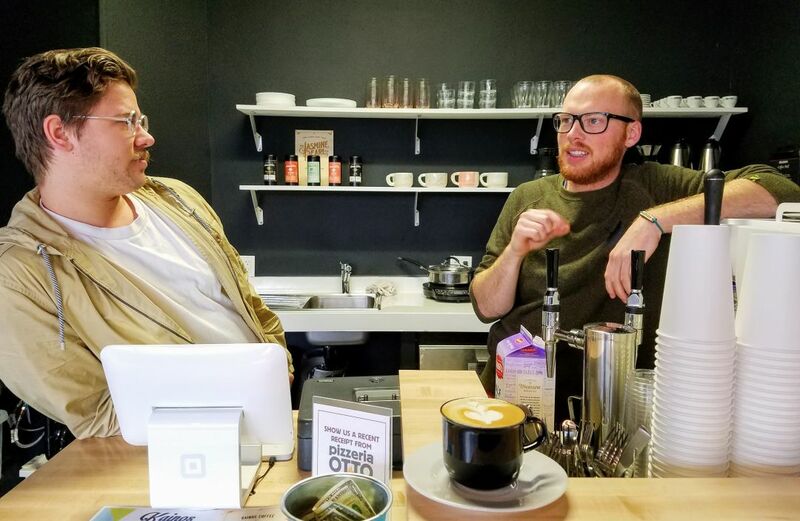 Kainos Coffee's Marten Boyden and Austin Roberts talking coffee, of course. The pair first met as grade schoolers in the Dalles, Oregon, later worked together at a wood-fired coffee roaster in Austin, Texas, and each migrated to Portland a few years back to launch their own bike-powered, wood-fired roaster. “Cliff jumping, snowboarding, coffee roasting…” Roberts ticks off their exploits. “It usually starts with me saying, 'I have an idea…’ finishes Boyden. For months, they’d hawk their buzzy cups in the morning and then close the cart to work on the buildout of their brick and mortar space three feet away each afternoon. 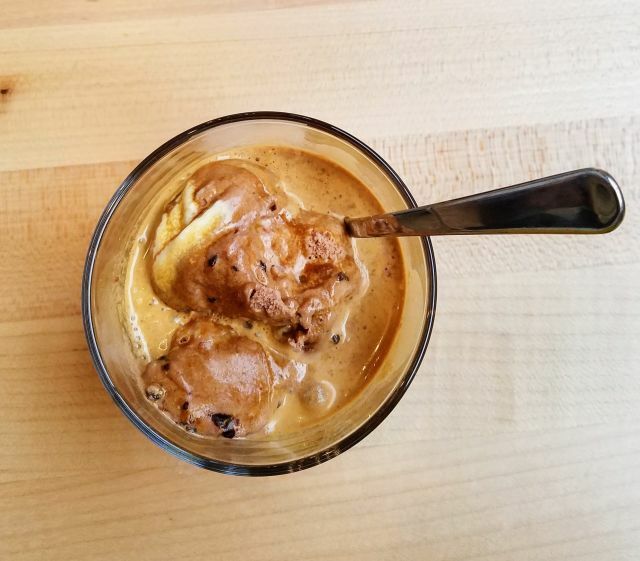 Kainos Coffee's depth-charge affogato—powered by house roast espresso and Tillamook ice cream. Plans are in the works for late-night hours, a Portland rarity inspired by Austin’s 24-hour coffeeshop scene, and Kainos hopes to become a safe, low-cost spot for community gatherings, too. A highlight is still listening to Boydon explain his roasts; the dude has an innate knack for tasting notes. 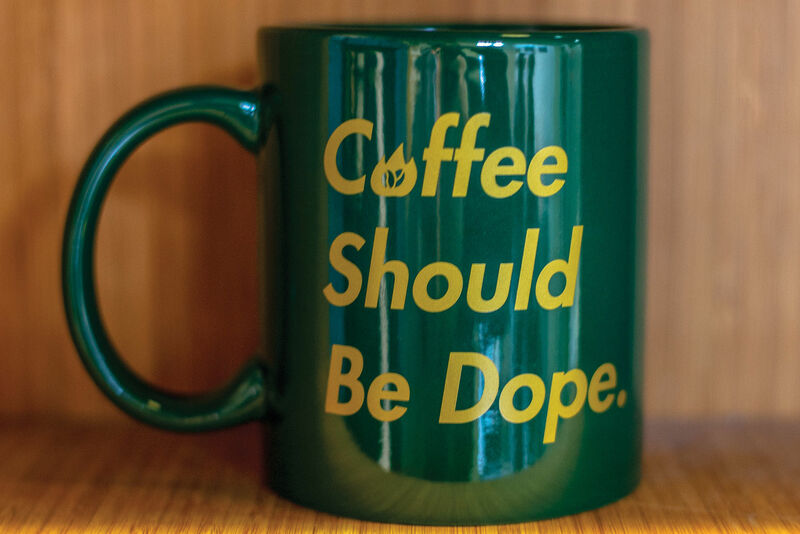 The Ethiopian Sidamo is a “straight-up blueberry muffin,” and the Tanzanian roast “legit; has a grapefruitiness with a Tabasco finish.” Again, he’s always dead-on. And, dammit, they’re both delicious. BEFORE & AFTER Kainos Coffee took over the Bacchi's deli space on NE 66th and Sandy Boulevard in late summer/early fall; hawking their coffees from a tiny cart during the café build-out. 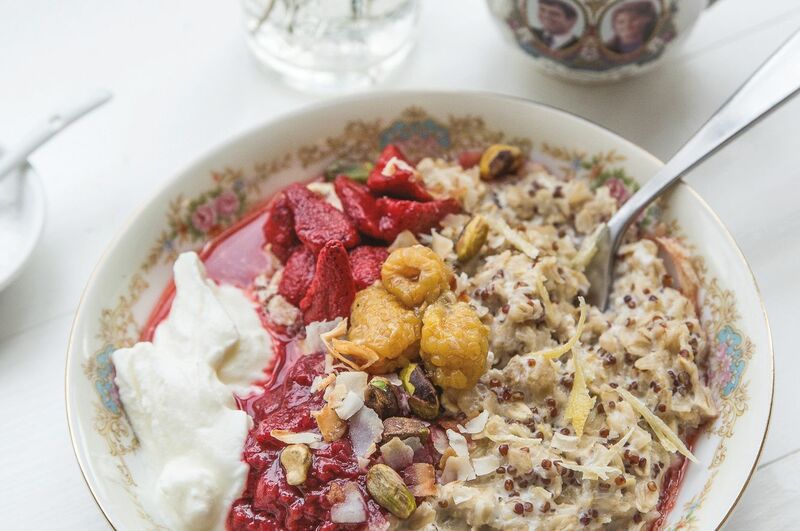 The brick-and-mortar Kainos opened in early November. 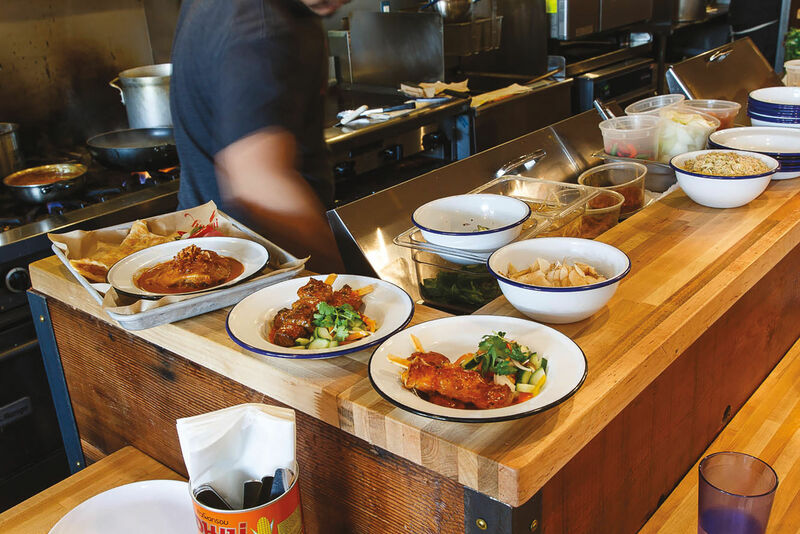 A stylish, framed sign to the right of the counter where the pair spend most of their waking hours shouts: “YOU DRINK, KIDS EAT.” It’s an odd statement, but one that either man will happily explain. Regardless of the quality of their roasts, the café is actually a front for the pair’s long-term commitment to good works—spurred by a summer working at Los Angeles’ Dream Center during high school. For the past four years, Boyden has spent time volunteering in the Philippines, helping kids get out of the garbage dumps outside Manila and into housing on a pineapple farm in Cavite, among other projects. Now, 21 percent of all the café’s proceeds benefit kids in need—specifically his Filipino charges. “[Long ago] I realized what I wanted to do is help other people. It ruined me career-wise,” jokes Roberts. Boyden agrees: “Our entire reason to start Kainos was to give back... I guess we do everything a little different.” The pair stare at each other and crack up—and then get back to work. Those coffee descriptions won’t write themselves.